The successor to an editor who stepped down weeks after taking on four new newspapers has begun his new role. Richard Howarth is now in charge of the Banbury Guardian, Bucks Herald, Bucks Advertiser, Hemel Hempstead Gazette and the Buckingham and Winslow Advertiser following the departure of Jason Gibbins. Jason had edited the Guardian since 2007, but took on the other titles as part of Johnston Press’s newsroom of the future restructure in the South Midlands in April. Jason revealed in May he would be leaving to take up a new role with the BBC England digital team in Birmingham. At the time, he said he would have stayed on in his role had the opportunity with the BBC not arisen. Richard, pictured above left, began his career on the Stratford-upon-Avon Herald in 1984, where he rose to the rank of sports editor. In 1987 he moved to the Rugby Advertiser as a senior reporter and property editor, before briefly working as news editor at the Coalville Times the following year. In November 1988 he took up his first editorship at Observer newspapers in Warwickshire, where he spent the next six years. 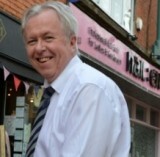 Between 1995 and 2009 he was series editor for the Northants Herald & Post, before working as a freelance and PR. In 2013 he returned to the Straford-upon-Avon Herald to take on its deputy editorship, a position he assumed at the Guardian the following year. A well-deserved overdue promotion to an editor’s chair.